Hoosier Beer Geek: A Beer Blog for Indiana, from Indianapolis: Partners in Housing's Brains & Beer 3 | 10/13/13, 6 - 11 p.m.
Partners in Housing's Brains & Beer 3 | 10/13/13, 6 - 11 p.m.
Long time readers may remember our good friend Chris Maples. Chris founded this blog in 2006 and has gone on to serve the community in other ways besides spreading the word about craft beer. Chris is now Director of Advancement for Partners in Housing, a local non-profit devoted to providing housing and social services for the homeless in Indianapolis. Not only does Chris share a love of craft beer with us, he also is into the zombie craze that leapt into America's public consciousness with the debut of AMC's acclaimed series, The Walking Dead. So for the last two years, Chris has held an ingenious fundraiser for Partners in Housing: Brains & Beer. The event, which was hosted for the last two years at Fountain Square Brewing Company, provided zombie fans with a venue to watch The Walking Dead Season 2 finale and Season 3 premier while enjoying pints of FSBC's excellent beers and contributing funds to a great cause. 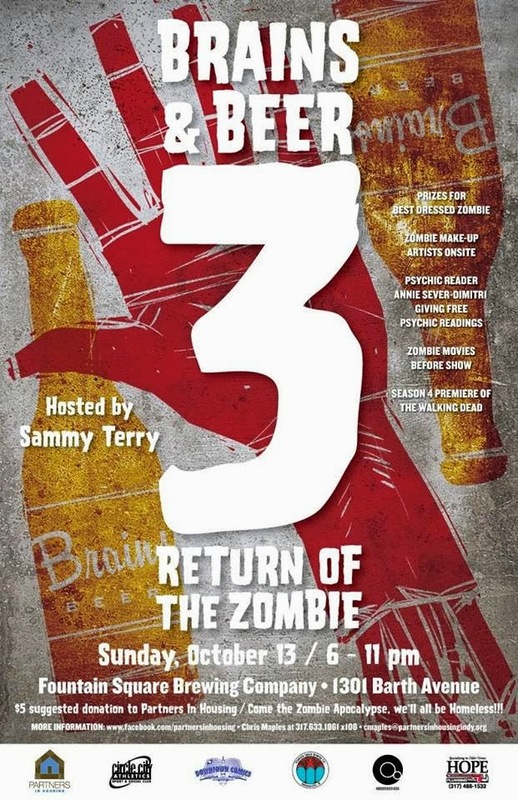 That event was so successful that on Sunday, October 13, from 6 to 11 p.m., Partners in Housing will stage Brains & Beer 3 at FSBC for the long-awaited Season 4 premier of The Walking Dead. We are very proud to be one of the event's sponsors, and we encourage you to come. FSBC's taps will be flowing for your drinking pleasure. In addition, there will be a zombie costume contest, free psychic readings, and, perhaps best of all, Sammy Terry will be the event's host. To see what you're in for, check out our post about last year's Brains & Beer 2.